Learn more about the latest updates below. 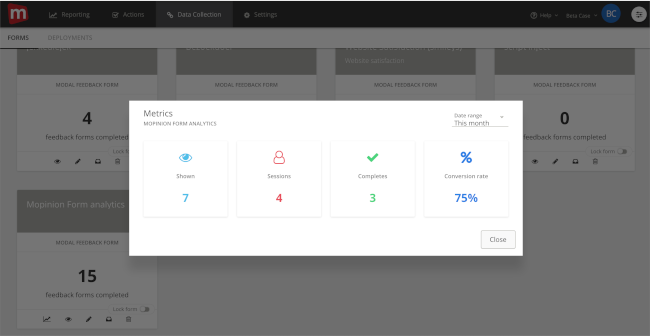 Mopinion has just released a new machine learning technology within its digital feedback analytics platform: automatic feedback categorisation. This technology employs machine learning techniques that make the analysis of qualitative feedback data – by way of labeling and categorisation – a much more fluid and systematic process. 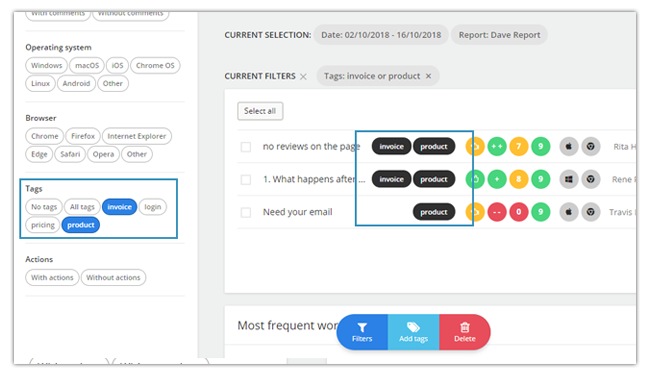 With the new technology in place, users who only occasionally labeled their feedback, for example, can now let the system ‘take over’, meaning the Mopinion software will start categorising feedback items automatically. Automatic categorisation can be activated based on setting up predefined tags. For example, if you add the label ‘invoice’, the system itself will search and find comments that fall under that category, even if other words or word variations of ‘invoice’ are used. Additionally, if after the system has categorised a feedback item and you find that the item has been incorrectly categorised, you can adjust the label manually and the system will learn from your adjustment and use that information for future categorisations. It also works the other way around: approve correctly tagged items to let the bot know it has done a great job! Please make sure you have some auto-tagging rules running to help the Mopinion bot on its way. The automatic feedback categorisation technology is the first of several new, built-in technologies to be launched by Mopinion, which will demonstrate the latest advancements in artificial intelligence and machine learning. After listening carefully to the feedback of our customers, we have decided to introduce ‘form metrics’ to our platform. 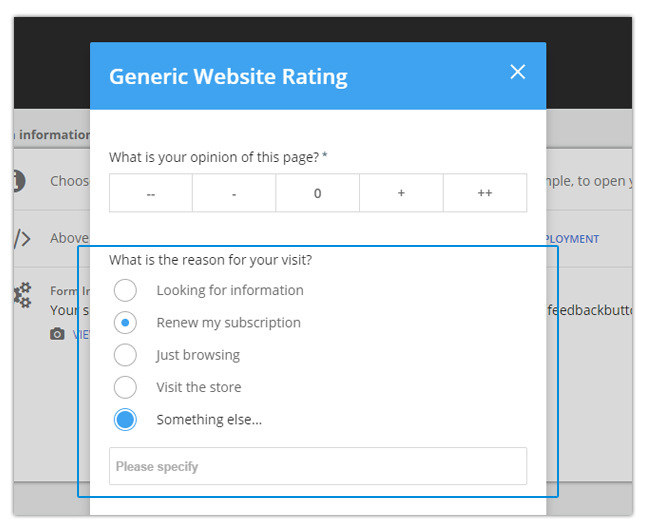 This new feature will enable users to quantitatively monitor how respondents interact with the surveys. 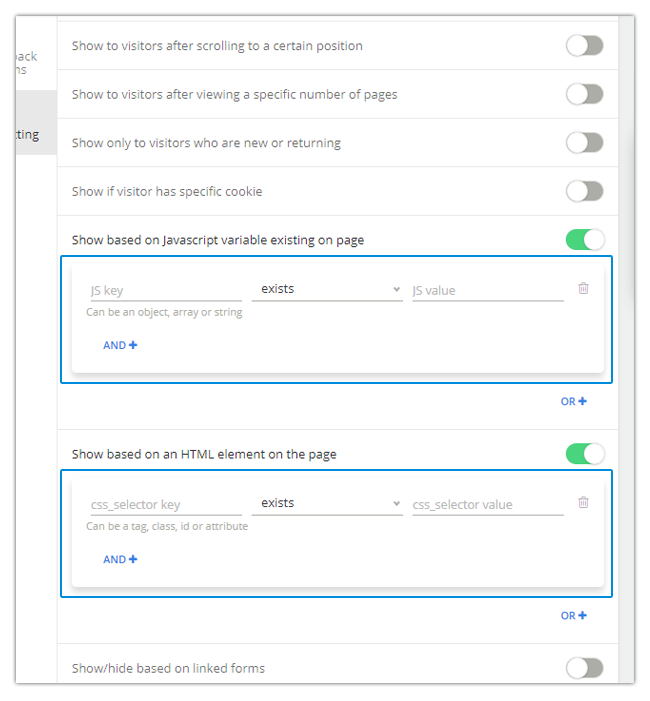 It will give you – as a user – insight into how many times a form appears, how the form is displayed, and how many times the form has been filled in entirely. You can turn on Mopinion Form Metrics in the form editor (click the “Edit form” button > go to Step 3: Configure / Advanced / Log form metrics). Note: this is switched off by default, and will only start counting when switched on. It is not applicable on historical data. For each of these measurements, you can filter on specific URL’s and select your own time intervals, such as today, last week and last month. Additionally, we’ve upgraded the Excel export process – specifically for the multiple choice questions in a feedback form. Now it is much easier for users to see which option/choice the feedback data belongs to in your exported excel sheet. In the first row of the Excel file, with multiple choice questions, it will show both the question as the multiple choice option in the column. Note: the total amount of columns will remain the same. 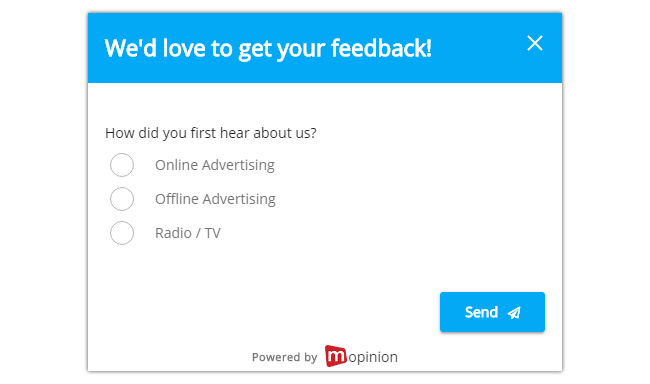 In the Deployment section of the Mopinion software, we have added a new option for the conditions within a feedback form. Users can now add more than one condition within a rule, using the ‘AND’ condition. For example, you can choose to only show a feedback form when cookie A and cookie B exist. Previously, users only had the option to add ‘OR’ conditions, meaning only one of the two conditions had to be true for a feedback form to be triggered. 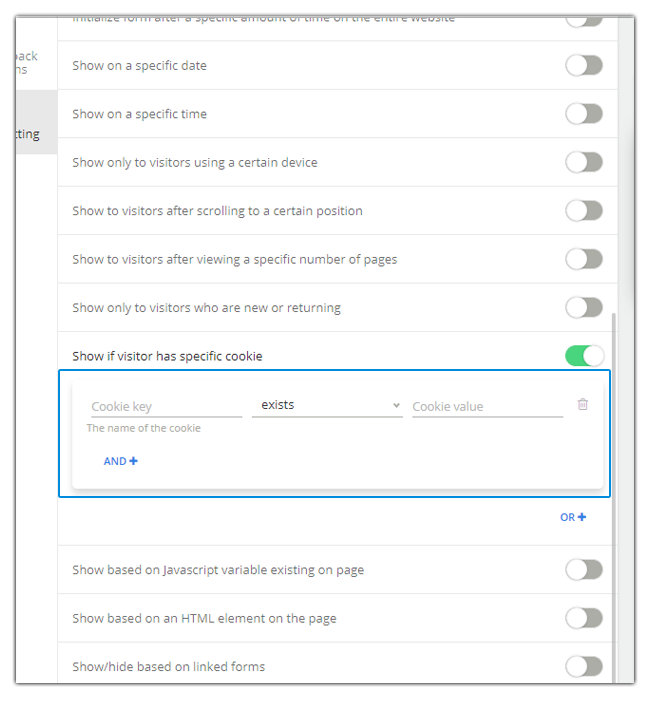 For example, you can choose to only show a feedback form when cookie A or cookie B exist. Interestingly enough, visitors have a tendency to click more frequently on the first answer option, which can potentially skew feedback results. To prevent this from happening, we’ve introduced a new randomisation option! Users can now choose to shuffle their multiple choice answer options in their feedback forms with the flip of a switch. This is done using the new ‘Randomise options’ button which can be found in the form builder. When the setting is on, your answers options will be shuffled at random so that the order changes. This includes the multiple choice options listed in radio buttons, checkboxes and drop down menus. It also works for shuffling categories. 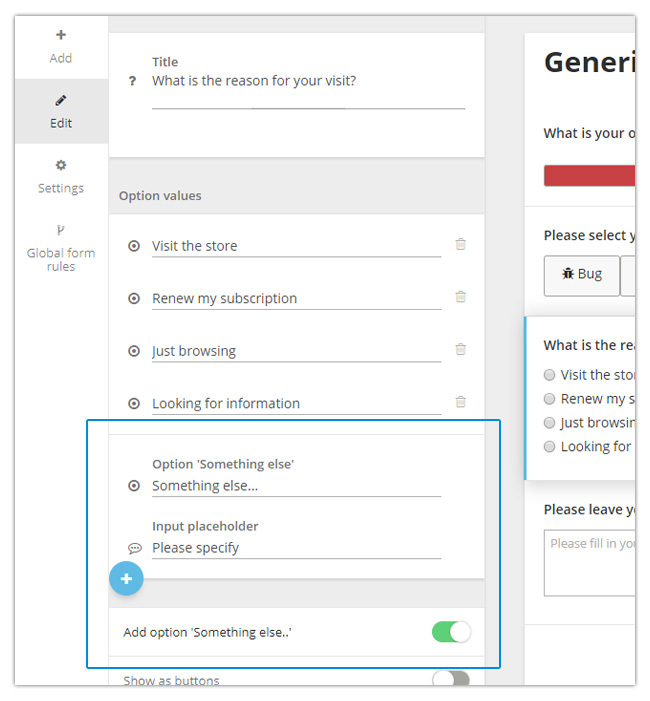 There’s a new option within the form builder called ‘Option Something else’ that enables users to automatically add an extra answer option that triggers an input for an open comment. The switch is available for dropdowns, radio buttons and checkboxes. This new feature is advantageous in that users can skip the step of having to separately apply question logics for their multiple choice questions. For example, previously, it was required to add a ‘rule’ that if the user clicked the ‘other’ option (Something Else), then the open text field with quesiton will appear, e.g. ‘Please specify your reason’. 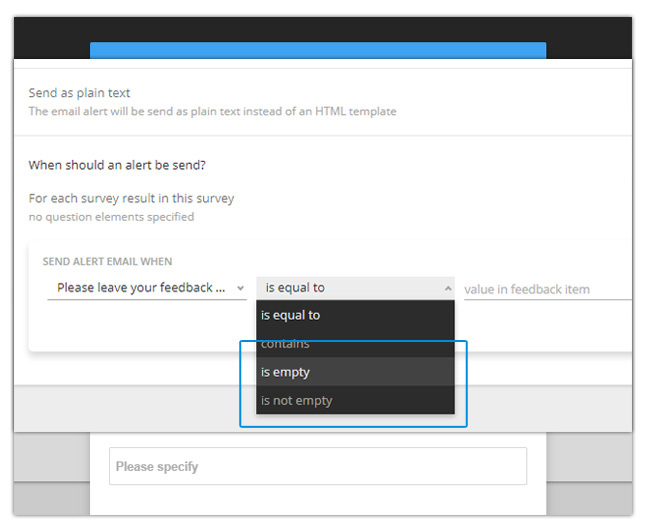 We have added a new condition to the email alerts section that allows users to specify if they want to receive alerts based on the field contents (empty or not empty). For example, if you want to receive an email alert when there is a comment in the open comments field, you can specify this by marking the field as ‘is not empty’ in the conditions section (and vice versa). Another useful application of this new condition is that you can use it with the contact details field. For example, you can set up email alerts with contact details to go to a certain inbox, and feedback without contact details to go to another inbox. Suggestions or questions about the new updates? Do you have ideas or suggestions on how we can improve our software to meet your needs? We are always open to new ideas! Feel free to send us an email.